America has become a country with a rapidly expanding population of overweight people. Today approximately 68.3 percent of American adults are either overweight or obese, and 33.9 percent are obese, according to the Centers for Disease Control and Prevention (CDC). The obesity epidemic is a rapidly growing problem in this country. In 2000, no state had an obesity prevalence of 30 percent or more. In 2009, nine states had obesity rates of 30 percent or more. And by 2010, the number of states that had obesity rates of 30 percent or more increased to 12. Why are these facts alarming? Obesity, defined as a Body mass index(BMI) of 30 or more, is the second leading cause of preventable death in the United States and results in an estimated $147 billion in health care costs each year. Several types of cancer are associated with being overweight, including cancer of theuterus, gallbladder, kidney, breast and colon. Other conditions linked with obesity include sleep apnea, osteoarthritis, gout, gallbladder disease and infertility. Obesity-related conditions worsen as weight increases and often improve as the excess weight is lost. Blood pressure at or above 130 mm Hg systolic (the top number) or 85 mm Hg diastolic (the bottom number); or you’re already taking medication to treat high blood pressure. What’s the difference between being obese and being overweight? The defining characteristic in both overweight and obese people is excess body fat. The difference is a matter of degree. Health care professionals use a simple calculation called the body mass index (BMI) to determine body weight relative to height. In adults, the BMI calculation strongly correlates with total body fat content in adults. Overweight is defined as having a body mass index (BMI) between 25 and 29.9. Obesity is defined as having a BMI of 30 or more. Use Health Women online calculator to check your BMI. Another way to determine your risk relative to your weight is to measure your waist circumference. Women with a waist circumference over 35 inches (and men over 40 inches) are at greater risk for disease. Where excess body fat is distributed on your body also plays a role in your risk for disease. Weight gain around your waist (specifically in your abdominal area) is more of a health risk than weight gained on your hips and thighs. Unlike fat around the thighs, which is more common in women and is more likely to serve as an energy reservoir, abdominal fat deposits fatty acids directly into the bloodstream for immediate short-term energy, increasing triglyceride and, eventually, cholesterol levels. Therefore, excess abdominal fat is associated with an increase in blood cholesterol and insulin resistance, which may result in diabetes. An “apple shaped” figure may also raise your risks for other life-threatening illnesses, such as heart disease and stroke. An excess of body fat—the defining characteristic of obesity—results from an imbalance between the amount of calories you take in and those you expend. The reasons for this imbalance are unclear, and the relationship between energy intake/expenditure and body fat storage and distribution varies from person to person. Assessing your weight to determine if you are obese involves two key measurements—body mass index (BMI) and waist circumference. Understanding your risk factors for conditions associated with obesity, according to clinical practice guidelines issued by the National Heart, Lung, and Blood Institute (NHLBI), is important. First, your health care professional should determine your body mass index (BMI), which describes your body weight relative to your height. It is strongly correlated with total body fat content in adults. Your BMI is your weight in pounds divided by your height in inches squared, then multiplied by 703. The following chart shows body mass indices for people of various heights and weights. To determine your BMI, find the row that most closely approximates your weight. Read across the row until it crosses the column closest to your height. You may also use Health Women online calculator. In addition to comparing your weight to a chart of established acceptable weight ranges, your health care professional can actually measure your body composition—the most accurate assessment technique because it differentiates between weight that is attributable to fat accumulation and weight that represents muscle development. 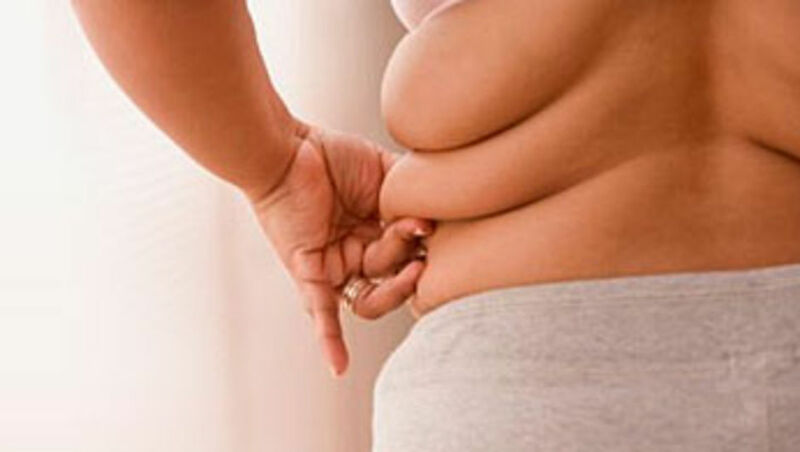 Women with more than 30 percent body fat (25 percent for men) are considered obese. However, it is difficult to measure body fat precisely. The most accurate method has been to weigh a person underwater, but this procedure is limited to laboratories with special equipment. There are two forms of BIA. With one form, the patient stands on a special scale with footpads and a harmless amount of electrical current is sent through her body to calculate the percentage body fat. The second type of BIA involves the use of a portable instrument called an impedance analyzer to transmit a noninvasive, low frequency electrical current through electrodes placed on the patient’s hand and foot with a gel. The change in voltage between electrodes is measured, and the patient’s body fat percentage is calculated. Unlike fat around the thighs, which is more common in women and is more likely to serve as an energy reservoir, abdominal fat delivers fatty acids directly into the bloodstream for immediate short-term energy, increasing triglyceride and, eventually, cholesterol levels. Health care professionals aren’t certain why this proves detrimental to your health, but higher proportions of abdominal fat are associated with higher risks of insulin resistance, diabetes, high blood pressure and cardiovascular disease (heart disease and stroke). Your health care professional also should ask you about or conduct tests to determine other risk factors for disease and conditions associated with obesity. It is important to tell your health care professional about any medical or health conditions you have and any medications, vitamins, minerals, herbs or nutritional supplements you’re taking. Also let your health care professional know if you are pregnant or breast-feeding or if you’re planning on surgery that requires general anesthesia. There is no accepted national definition for the title “nutritionist.” Some states have a statutory definition of nutritionist stating that the RD credential is not required for certification as a nutritionist but is required for licensing as a dietitian. In general, the license or certification as a dietitian can be obtained with a bachelor’s degree and a related supervised practice experience component (or proof of RD status with the Commission on Dietetic Registration), while the nutritionist licensure or certification typically requires a master’s degree or higher. Make sure any nutritionist you see is licensed by a state agency. Nutritionists, with educational background in foods and nutrition, and dietitians evaluate the diets and nutritional habits of clients and help structure more healthful eating patterns and weight-management strategies based on their patients’ health needs, food selection and calorie goals. Nutritionists usually do not advise patients with chronic illnesses, disorders and other disease conditions. An RD is a dietitian who has completed academic and practice requirements established by the American Dietetic Association. These include a bachelor’s degree, an accredited preprofessional experience program, successful completion of a national credentialing exam and ongoing continuing professional development. Many RDs also have a master’s degree and advanced training in a nutrition subspecialty, such as diabetes. Endocrinology is the field of medicine involving the body’s chemical messengers, or hormones, and its biochemical control mechanisms, or metabolism. Endocrinologists are physicians who care for patients with complex hormonal disorders and metabolic conditions, including obesity, diabetes, thyroid disorders, metabolic bone disease, pituitary and adrenal conditions, and growth and gonadal disorders. These physicians have specific training and clinical expertise in managing obesity and the related medical problems. Losing as little as 5 percent to 10 percent of your body weight and maintaining that loss can significantly improve your health by increasing glucose tolerance and lowering blood pressure and cholesterol levels. Thus, if you’re overweight or obese, you may need to seek medical help to lose weight as well as to maintain it. The National Weight Control Registry is tracking over 10,000 individuals who have lost significant amounts of weight and kept it off for extended periods of time. Members of the registry have lost an average of 66 pounds and kept the weight off for an average of 5.5 years. The good news is that burning off more calories than you’re taking in will cause you to lose weight. The bad news is that there’s no magic formula. Studies find that if you lose the weight slowly, you’ll be much more effective at keeping it off, especially if you incorporate exercise into your routine and reduce other sedentary behavior, such as watching TV. The first element of treatment is changing your diet. Your health care professional should provide detailed guidance on the number and types of calories you should eat. As a rule of thumb, however, if you take in about 250 calories per day less than is needed to maintain your current weight, combined with an exercise regime that burns an additional 250 calories a day, you’ll lose about a pound a week. The number of calories your body needs to maintain its basic functions such as breathing and digestion is known as your basal metabolic rate (BMR). Several factors go into the calculation of your BMR, including your age, height, weight and gender. To get an idea of your BMR,. It’s difficult to determine exactly how many calories you need to maintain your weight at your current level of physical activity. One way to estimate your BMR is to keep a detailed food diary over the course of a few days to a week during which you maintain your weight. Determine exactly how many calories you eat on an average day (several books and Web sites provide calorie counts for thousands of foods) and use that figure as a starting place from which you then subtract 250 calories. After you’ve determined how many calories a day you should eat, you need to plan daily menus. A dietitian or nutritionist can help you plan menus that include the types and amounts of food you should eat, which, in most cases, should be based on guidelines developed by the federal government in its 2010 Dietary Guidelines for Americans. The guidelines emphasize calorie reduction as well as balance, moderation and variety in food choices, with an emphasis on whole-grain products, vegetables and fruits. To satisfy basic nutritional needs, eat a variety of foods including low-fat dairy, healthy protein sources like chicken, fish, eggs and soy products, vegetables and whole grains, and allow for an occasional treat. While you should try to cut back on excess fats and sugars, all foods and beverages can be consumed in moderation. As soon as you label a food as “off limits,” chances are you will crave and perhaps even binge on it.